The National Museum of Contemporary Art, Athens (EMST), in the framework of the Year of Cultural Exchanges between Greece and China started a collaboration with the National Art Museum of China (NAMOC) with the aim of strengthening transnational relations and intercultural exchange in the field of art between the two countries. After the presentation of the exhibition CHINESE XIEYI: Masterpieces from the National Art Museum of China in Athens at EMST in autumn of 2017, part of the EMST Collection will travel to Beijing. 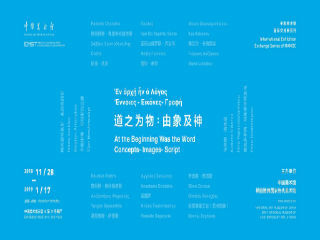 At the exhibition At the Beginning Was the Word. Concepts – Images - Script approximately 80 works of 40 Greek and international artists will be presented at NAMOC from November 28, 2018 to January 17, 2019. Two important civilizations, Greek and Chinese, contributed to several different levels for the formation of the western and eastern culture. Starting from that point, the exhibition examines the transition from the meaning to writing and the conceit within the speech and the image, with vehicle the international language of art, history, politics, and philosophy. The works of contemporary art are seen as a canal not only of the aesthetics and the artistic tradition but of the historic past as well, compliant by the optics of today. The National Art Museum of China (NAMOC) is a national art museum of plastic arts dedicated to collection, research and exhibitions of modern and contemporary artistic works in China. Starting to be built in 1958, NAMOC, with its title board inscribed by Chairman Mao Zedong, was formally open to the public in 1963. NAMOC is a national cultural landmark after foundation of New China. The main building, roofed with yellow glazed tiles and surrounded by corridors and pavilions, features the styles of ancient Chinese attics and traditional architecture. The building, with 21 exhibition halls in its 5 stories, covers an area of more than 18,000 square meters. The museum boasts an exhibition area of 8,300 square meters. A modern collection storeroom founded in 1995 covers an area of 4,100 square meters. The museum houses more than 100,000 pieces of various collections, most of which are representative works of different periods and great artworks of Chinese art masters from the end of the 19th century till today, constituting art development history since the beginning of modern China. Collections also include some ancient paintings and calligraphy works, foreign artistic works as well as plentiful folk art works. The museum collects works of many great artists such as Ren Bonian, Wu Changshuo, Huang Binhong, Qi Baishi, Xu Beihong, Liu Haisu, Jiang Zhaohe, Situ Qiao, Li Keran, Wu Zuoren, Ye Qianyu, Dong Xiwen, Luo Gongliu and Wu Guanzhong. The museum also collects hundreds of foreign artistic works. German collectors Mr. and Mrs. Peter Ludwig donated 117 pieces of foreign works to NAMOC in 1999, including 4 oil paintings of Picasso. From 2003 until 2008, EMST presented exhibitions and events at the Athens Concert Hall, at the Athens School of Fine Arts, in the public space and in other spaces, while from 2008 until 2014 it was hosted in the Athens Conservatory. After the Museum’s relocation in its permanent premises, in 2015 and while in the process of implementing its permanent collection, EMST continues its activity and temporary exhibition program. The first exhibition in the new premises, entitled Urgent Conversations: Athens – Antwerp, was a synergy with the Museum of Contemporary Art Antwerp M HKA in 2016 and constituted the inaugural exhibition of the series EMST in the World. The second exhibition of the same series was realized through the collaboration of EMST with documenta 14 and lasted from April to September 2017. The two organizations collaborated in the framework of “learning from Athens” – documenta’s chosen working title – and materialized the intention of EMST to become extrovert and to exhibit its collection to the public. As a result a double relocation occurred: the former Fix brewery became the main exhibition space of documenta 14 in Athens and Fridericianum became the temporary home of part of the Museum’s collection in Kassel. The exhibition, titled ANTIDORON. The EMST Collection, presented over 220 works, part of the EMST permanent collection. Continuing the EMST in the World Series, the next step was the collaboration with Galleria Nazionale d’Arte Moderna e Contemporanea in Rome, presenting from September to November 2018 the exhibition La verita e sempre un’ altra (Η αλήθεια είναι πάντα μια άλλη), including more than 20 works from the EMST Collection, hosted within Time is Out of Joint, the current set up of the Gallery’s permanent collection. The Museum’s constantly growing collection is formed around an important nucleus of works by Greek and international artists, such as Jannis Kounellis, Stephen Antonakos, Gary Hill, Vlassis Caniaris, Chryssa, Mona Hatoun, Emily Jacir, Ilya and Emilia Kabakov, Kim Sooja, Nikos Kessanlis, ShirinNeshat, Lucas Samaras, Costas Tsoclis, Bill Viola, Joseph Kosuth, Pedro Cabrita Reiss, Costas Varotsos, George Lappas, Oliver Ressler, Gulsun Karamustafa,Chen Zhen a.o. The pivotal moment for EMST in continuing its dynamic development was the approval of a majorgrant by the Stavros Niarchos Foundation. The funds will allow the Museum to undertake the work needed to realize its core strategic goal of full operations, with the equipment and implementation of the approved plans for the installation of its permanent collection on the three top floors, the operation of the media lounge, and the completion of the screening and conference room, the library, the archives, the roof terrace and other areas. During the same time, the public tender for the operation of the cafe and restaurant will also have been completed.